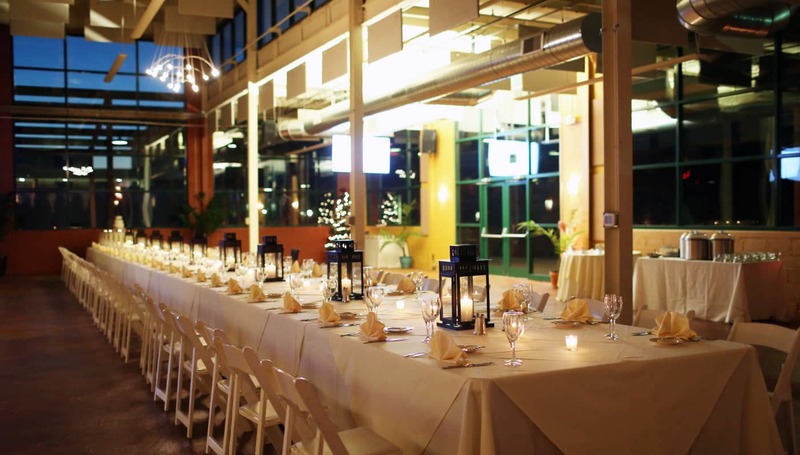 Events at Franklin Commons are unique, eclectic and original! Franklin Hall is perfect for couples looking for a modern, industrial-chic space with rustic touches. When up to 250 of your family members, friends and co-workers are gathering for your wedding, Franklin Hall provides an amazing setting which includes a custom-sized dance floor, soaring ceilings, plenty of natural light, LED uplights, pin spot lights, and direct access to outdoor spaces such as the Courtyard and Campus Walk. Complimentary Wi-Fi is available for #hashtag posts. Stroll through our ever-changing Art Gallery to see some of today’s most interesting artists’ works. Campus Walk is situated adjacent to Franklin Hall and is perfect for an outdoor covered cocktail hour, ceremony, or dessert. 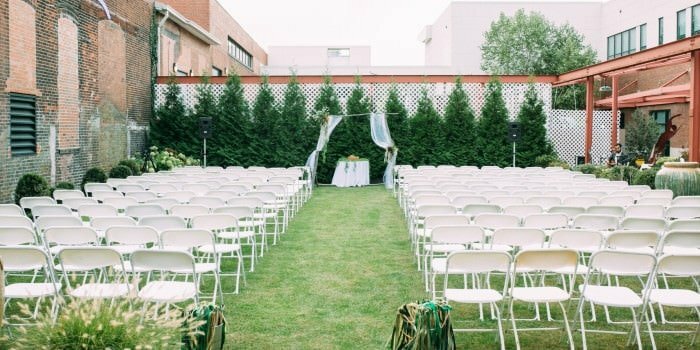 The Courtyard hosts your outdoor wedding ceremony with tall arborvitaes, a trellis, water features, and our exclusive LED kite! 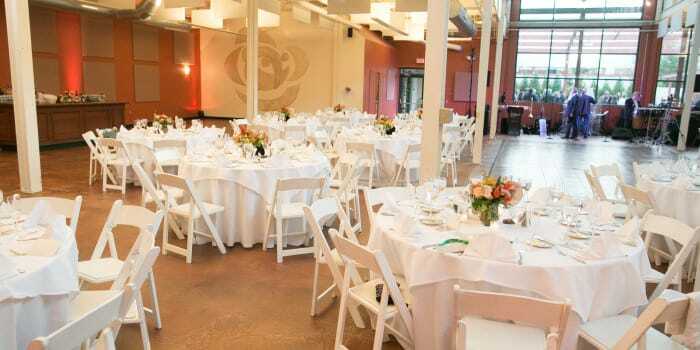 The Bistro adds to your reception for larger guest lists of over 250 invitees. Franklin Hall is a scalable space with a custom size dance floor, soaring ceilings and options for custom audiovisual services. Campus Walk stretches from the east to the west in the center of the “campus” with unique sculptures & beautiful landscaping. 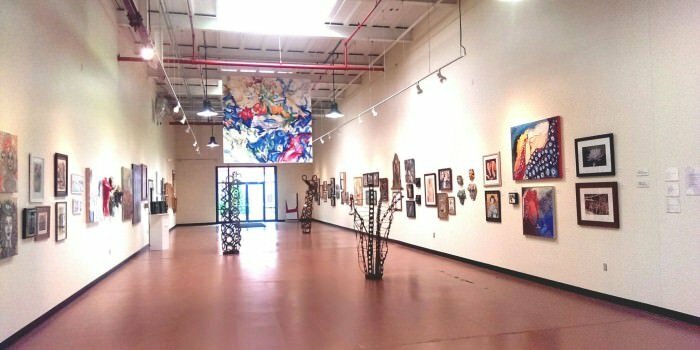 The Art Gallery is a unique setting to host your wedding ceremony or cocktail hour amidst the beauty of local artwork. 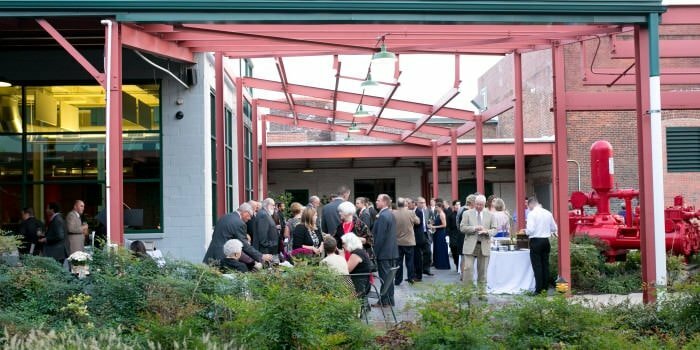 Perfect for your outdoor ceremony, the Courtyard is a plush green space featuring soothing water features and a vintage steam engine.